Hive closer, jams in the entrance with a string to pull it out when ready. Contains holes for air circulation not big enough for bees to get through. If you move your bees more than half a metre they will get lost and buzz around the area the entrance used to be. When darkness falls they may die of cold unable to find the entrance. Moving a short distance such as a metre. If you want to move your bees a short distance, say a metre, then move the hive about half the width of the hive every few evenings until you have it in the spot you want. Do this after dark. Moving a short distance but further than a metre. Its probably easier to move your hives at least 3 km away, leave them for 2 - 4 weeks and bring them back into the new position. By moving them 3 km away or more, they re-orientate with their surroundings and re map their new position. See below for tips on moving hives. The method used can depend on the weather. If it's hot, then sealing the hive/s shut without air circulation for a number of hours could kill your bees. Decide on the method you will use to close the hive entrance. Some use galvanised flat metal, others use wet sponge others use a grid for air circulation, and some don't close the hive entrances at all. If your bees become too stressed from moving this could make them more susceptible to disease such as EFB. You can use a migratory screen instead of a hive lid for good air circulation keeping the bees at a comfortable temperature. Make sure you have enough fuel to travel to where you are going without having to re fuel. Service stations are not too keen on a truck load of bees with open entrances re fuelling, as the bright lights at night will attract the bees out of the hive! Ensure the hive boxes are full of frames so that they don't move and kill bees. 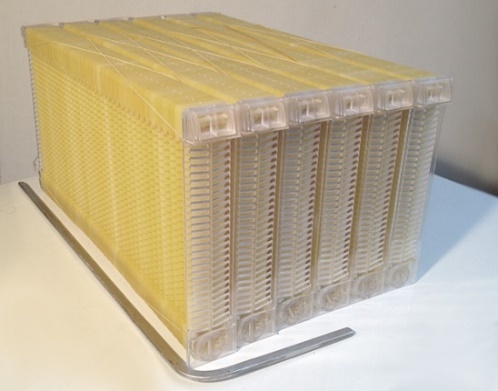 Strap hives with an Emlock fastener or spring clips if you are confident they will hold the hive secure. 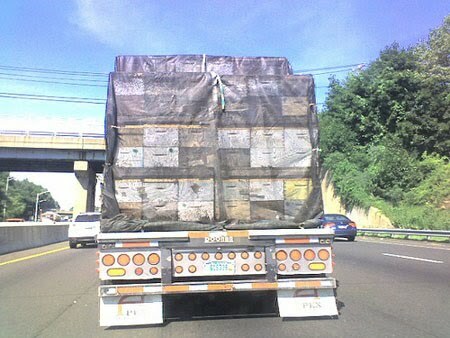 Cover the load with a net to hold it firmly in place, use strong ropes or straps to tie the load down firmly. Make sure the site is ready and prepared for the hives to be dropped off in their new position without keeping the bees locked up longer than necessary. Move them overnight when its cool. Load them late evening (depending on time of the year and weather conditions). When they are in their new position open the hive entrance. Have your protective gear with you. There are a number of reasons why you would re-queen. replaces an old queen that is not laying well. You can choose the type of queen you want, you can choose to have a queen resistant to disease, that produces bees that are good at wintering, bees that prefer cool temperatures or bees that prefer hot temperatures depending on where you live. You can choose to re queen in autumn if a hive/s looks weak to help them winter well. Or you can choose to requeen in spring. Order your queens in time. Your new queens will arrive in a queen cage maybe through the mail, and you need to establish her into the hive as soon as possible. Pollination means the transfer of pollen from the male part of the flower, the anthers, to the receptive female part, the stigma. More than 40% of our food crops depend on honey bees for fertilisation. No bees, no food. This can be done in a number of ways. Sometimes the pollen is blown by the wind, but most fruit trees need insects to carry the pollen from flower to flower. There are a number of insects that can do this, but the honeybee is very efficient. Honeybees can be managed by beekeepers, that way hives can be put into an orchard at the right time to pollinate the flowers to become fruit. The orchardist must not spray for a few days before the beehives arrive and while the bees are there as this may kill the bees. Honey bees travel from flower to flower, collecting nectar (later converted to honey), and pollen grains. The bee collects the pollen by rubbing against the anthers. The pollen collects on the hind legs, known as "pollen baskets, or pollen sacks". As the bee flies from flower to flower, some of the pollen grains are transferred onto the stigma of other flowers. Nectar provides the energy for bee nutrition; pollen provides the protein. When bees are rearing large quantities of brood, bees deliberately gather pollen to meet the nutritional needs of the brood. The management techniques of a beekeeper providing pollination services are different from, those of a beekeeper who is trying to produce honey. Millions of hives of honey bees are contracted out as pollinators and honey bees are by far the most important commercial pollinating agents. Beautiful Gippsland Honey can be purchased through this website by going to the Contact Us link and send an email to Bill Ringin. According to: Honey bee facts Honey is the only food that includes all the substances necessary to sustain life, including enzymes vitamins, minerals, and water; and it's the only food that contains "pinocembrin", an antioxidant associated with improved brain functioning. Honeys vary greatly in colour, taste and aroma. Generally the lighter the honey the milder the taste. The darker the honey the more distinctive the taste. This is not always the case but is a good guideline. The following list was provided by Sticky Stuckey's Pure Australian Honey. Image Royal Melbourne Show GAA Stand. 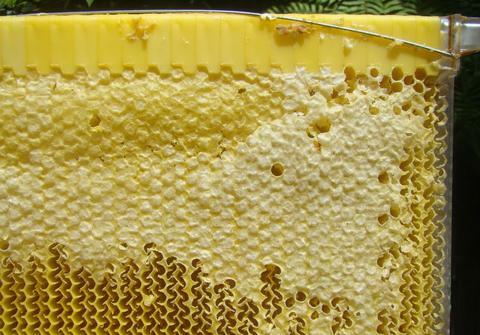 Chronic wound infections and antibiotic resistance are driving interest in antimicrobial treatments that have generally been considered complementary, including antimicrobially active honey. 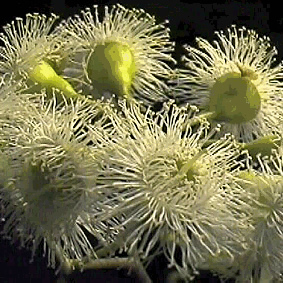 Australia has unique native flora and produces honey with a wide range of different physicochemical properties. In this study we surveyed 477 honey samples, derived from native and exotic plants from various regions of Australia, for their antibacterial activity using an established screening protocol. 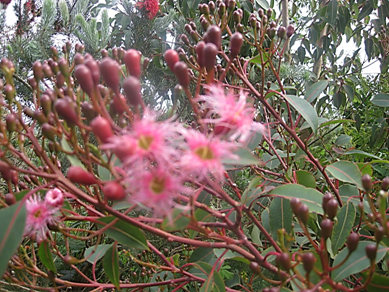 A level of activity considered potentially therapeutically useful was found in 274 (57%) of the honey samples, with exceptional activity seen in samples derived from Marri (Corymbia calophylla), Jarrah (Eucalyptus marginata) and jellybush (Leptospermum polygalifolium). This study has shown that many honeys have potential for therapeutic use as antibacterial agents. 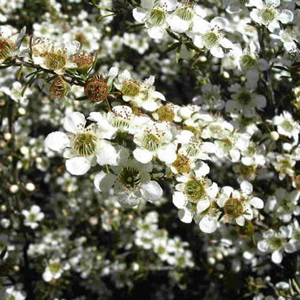 Jarrah and marri honeys have exceptional levels of hydrogen peroxide-dependent activity, and non-peroxide activity in Australian Leptospermum honeys is comparable to that found in New Zealand manuka honey. 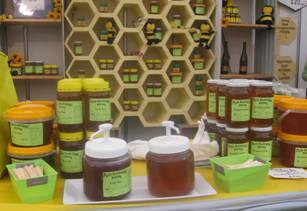 These findings indicate that there is an opportunity for Australian apiarists to share in the lucrative medicinal honey market. Acacia is made from nectar collected from Acacia tree blossoms which produce a honey that is remarkably clear and pure. 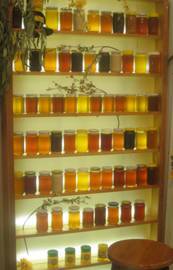 It is one of the most popular and sweetest honey varieties because of its mild delicate floral taste. It can remain in a liquid state for a long period of time due to its high concentration of fructose. 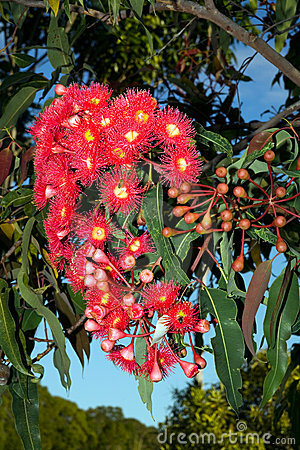 Eucalyptus honey comes from one of the larger plant genera, containing over 500 distinct species and many hybrids. Its country of origin is Australia but is also produced largely in California. Widely available, it varies greatly in colour and flavour but tends to have a special herbal flavour carrying a hint of menthol that may not be most pleasing to children's palate. This honey is traditionally used by many people as a protection against colds and headaches. As a tea lover, I would also recommend it as an ingredient to liven up your morning or afternoon tea. If you buy local honey it contains tiny amounts of pollen from your local area. By taking a spoonful of local honey a day can help prevent allergic reactions to pollen in your area such as watery eyes and sneezing. It will help young children build up an immunity to local pollen. Honey has long been recognized for its anti-microbial activities and was a favourite dressing for serious wounds for centuries. Honey is also high in antioxidants, a group of nutrients that, among other things, may help lower your risk of some types of cancer. But perhaps the most interesting therapeutic use for honey is as a natural remedy for seasonal allergies. According to various natural health practitioners, the tiny amounts of pollen found in locally-grown raw honey work over time to desensitise the body to a particular allergen--not unlike the way traditional allergy shots work. 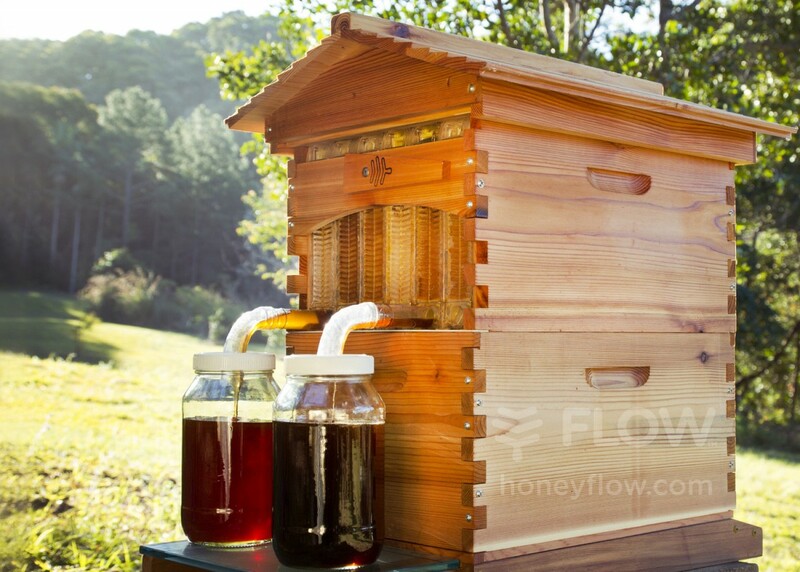 We want to hear from people who have bought flow hives and the experience they have had with them. We want to provide information and tips to our members with flow hives to help them with any difficulties they may be having. As this is all new and experimental it is important to forward on as much information as we can. So send in problems, questions and experiences and we shall put the information on this page and in our newsletters to keep you all informed. The taps can’t be turned on unless the cells in the frame have been mostly capped by the bees. Capped cells have a wax cover over the cells to show the honey has been ripened and is ready for harvesting. If the cells are not capped, the honey may have a high moisture content meaning it will go off after a month or so. The picture shows capped cells at the top, and uncapped cells at the bottom. The taps can’t be turned on unless the weather is warm which allows the honey to flow. It can take anything from 20 minutes to 2 hours for the honey to run out of a frame. The bees cannot refill the frame unless the frames are returned to their original position once drained. When draining the honey, it’s better to use containers with lids. This prevents bees robbing and/or drowning in your jars and prevents other insects contaminating your honey. This picture shows jars with lids. Flow hive beekeepers are finding that they can run a normal (Langstroth) brood box, above that a queen excluder and above that a normal super and above that the flow hive. 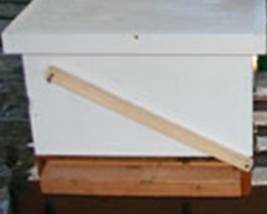 The philosophy behind this method is that the brood box produces more bees, the super on top provides those bees with their honey food supply and the flow hive on top provides excess honey that the beekeeper can take. Let me know what method you use and why so that we can include that information on this page and the next newsletter. You Tube Links for flow hives. There are many more episodes and subjects. For local advice please ask your club for a mentor to help you with your bees, as well as the Facebook pages Gippsland Bees - South Gippsland bees - West Gippsland Bees.